A few years back, my mischievous little bichon shitzu, Sadie managed to hop up on to the kitchen table, knock a rotisserie chicken off the table and along with her “sister” – our 90-pound Old English Sheepdog – polish it off in the twenty minutes that I’d stepped out of the house to pick my daughters up at the bus stop. Having spent $1700 the previous year to have Sadie’s stomach pumped “as a precaution” after she broke into her sister’s arthritis medication and downed twenty-five of the meat-flavored pills, I wasn’t inclined to take her back to the animal hospital – particularly during rush hour traffic. So after trying unsuccessfully to diagnose the problem online, I called a veterinarian hotline, punched in my credit card number to pay the $49.95 fee and in minutes, was forwarded to a vet who advised me about what signs to look for to determine if Sadie was in distress, as well as a few home remedies that could alleviate discomfort. After 24 hours, Sadie seemed fine; either she had an iron stomach or her sister gobbled up most of the chicken. But I saved myself the inconvenience of a trip and at a minimum, the $200 cost of a vet visit. Unfortunately, when it comes to legal problems, consumers don’t have the same options. There aren’t many lawyers who will answer unsolicited questions by phone for $49.95 – and who can blame them? Even in a highly automated practice, it’s simply not worth most lawyers’ time to open up a file, send an engagement letter, answer the question and send an invoice to collect fifty bucks. 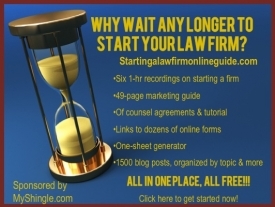 And while some lawyers – myself included – will often answer simple questions gratis rather than going through the rigamarole of on boarding the prospect, making a habit of dispensing free advice can eventually cut into billable time. So you’d think that legal regulators, whose purported mission is to protect consumers would stand up and applaud a platform like Avvo Advisors , a service that gives clients access to legal advice dispensed in 15 minute spurts for the low price of $39.95. Heck, you’d think that solos — who are often interrupted multiple times a day with clients who want a quick answer, and not a $175/hr consult would cheer for Avvo Advisor as well – because instead of having to act rudely or unresponsively towards these callers, lawyers can direct them to a place where they can have their question answered. Likewise, solos can also accept Avvo calls during downtime to earn lunch money and gain access to a new contact – without the hassle of performing intake, opening up a client file and then sending an invoice — because Avvo’s done all of the work for them. Unfortunately no. As technology accelerates, bar regulators and many attorneys are assuming the role of Seinfeld’s George Constanza doing the opposite . In other words, when a perfectly rational system emerges that’s win-win for everyone by providing access to justice and easy money (albeit just lunch money) for lawyers, they simply do the opposite and look for ways to quash the service rather than promote it. How else to explain New Jersey’s recent ethics opinion that bans New Jersey lawyers from participating in either Avvo Advisors or Avvo Legal Services (where lawyers provide legal services at fixed fees), finding that Avvo’s retention of a percentage of the $39.95 or fee paid constitutes an impermissible referral fee and unlawful fee splitting. For similar reasons, Ohio, South Carolina and Pennsylvania also deemed Avvo’s services unethical . As I’ve written before, the regulators’ decisions are so illogical that it’s hard to believe that the authors are actually lawyers. The percentage that Avvo retains from these transactions is no different from the service fees charged by credit card companies. Just as credit card companies collect a charge from each transaction to cover the cost of the service, Avvo’s percentage reflects the service that it provides to users – not just marketing, but also the convenience to lawyers of not having to perform intake or send out an invoice. Meanwhile, regulators have no problem with systems where lawyers give away advice for free. Thus, the New Jersey bar blessed prepaid legal services offered by companies like Rocket Lawyer and Legal Zoom, where consumers pay a flat to the plan and in exchange, are entitled to limited advice and 30-minute consultations which are provided by lawyers through RocketLawyer’s Q&A service. Of course, the New Jersey Bar decision didn’t note RocketLawyer’s practice of including its free Q&A service as part of a $239/month package of start up subscription services package provided by a company called Gust Launch . So in other words, it’s alright for a company to resell for profit those services provided by lawyers for free, but it’s not okay for a company like Avvo to retain a percentage of fees paid to lawyers. In what universe except for the self-regulated monopoly of legal services does any of this make sense? Meanwhile, for solo and small firm lawyers who celebrate this decision not because it makes sense, but because they hate Avvo (and I get it, there’s much to dislike), are you ready to open up a file, draft a retainer and bill clients to answer their questions at forty bucks a pop? If the answer is no, then you’re equally complicit in depriving consumers of access to law.